The music of Cats and Cats and Cats is not the easiest to describe. The biography on the band's official website describes their sound as “catchy math rock with folk inspired post rock sections”, but for me, the band's music is so much more than that. Imagine a sound that incorporates the energy of Los Campesinos, the indie folk of Sufjan Stevens and the bouncy pop of Belle and Sebastian. Add some spiky melody lines, offbeat drums and a dash of accordion and you're almost there. Given that C&C&C's sound has so many elements to it, it won't come as a surprise to learn that Motherwhale is not an immediate album. The songs are complex and frequently veer off on tangents (seemingly, anything but a standard verse-chorus-verse-chorus goes), and it's not always obvious where one track ends and another begins. On the surface, this can make Motherwhale appear like a disjointed mish-mash of ideas, rather than a coherent and considered work. 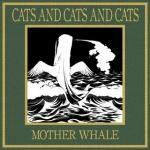 But those who persevere and take the time to get to know the album will see Motherwhale for what it really is. Behind the energy and the epic sound lies raw, beautiful emotion, a passion for music and some classic songwriting. Some may argue that, given the quality of the songs on Motherwhale, it's disappointing that the production isn't better and that some of the vocals are noticeably out of tune. For me, however, the lack of polish is what makes Motherwhale a raw, personal and enjoyable experience. As a fusion of light-hearted, energetic, experimental pop-rock and heartfelt British folk, Motherwhale is an album made by people with an obvious joy for sharing their own, interesting brand of music. And it's really rather good.